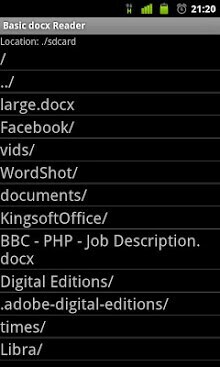 “It’s not big and it’s not clever”, it is in fact a tiny and efficient docx (word 2007/2010) file reader. Support is limited to basic tables, lists and text but if you want a tiny app that lets you open a docx from dropbox, the web, email attachments* or your local file system then this will get the job done. No advertising. Not now, not ever. It is basic, but if you like it please leave a positive review. Every little helps. If you don’t like it, please email me to tell me what’s wrong before leaving me a negative review. Chances are I’ll get back to you, we’ll talk and the app will get fixed. If you’re asking for new features you maybe waiting a little longer as this is something i do for free, in my spare time. *attachments currently can’t be opened due to a permissions error, will release a fixed app with corrected manifest as soon as i can. Spot on! This is the first app I’ve loaded for my new smartwatch that I’m immediately pleased with. It opens docx files attached to email. It wordwraps which is essential on the small screen. 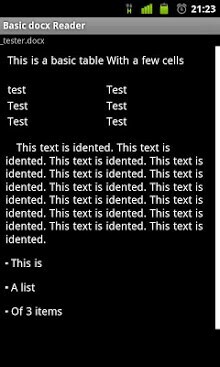 I would like more basic formatting to be kept (hyperlinks, italics, maybe font sizing and colour etc.) but I expect this is in hand. Well done!